Strolls along cobblestone streets in old European villages. Sunsets on suspiciously secluded beaches. Adirondack chairs. Lots of Adirondack chairs. These are your stereotypical images of retirement. But, if you want a look at a truly stereotypical retirement, then you should follow the money. 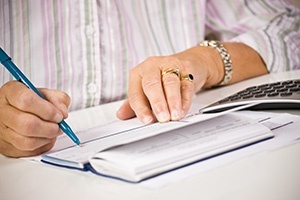 The most recent Bureau of Labor Statistics Consumer Expenditure Survey, a report on spending habits of American consumers, provides a financial picture of life in retirement versus life while working. Older adults (those age 65 and older) spend on average $47,756 per year. That’s over $11,000 less than the annual average spent by all American consumers combined. Without children in the house and no work-related expenses, most people can expect their spending to drop in retirement. However, some expenses stay relatively the same while others – health care – continue to grow. Of course, retirement isn’t something you buy off the shelf. 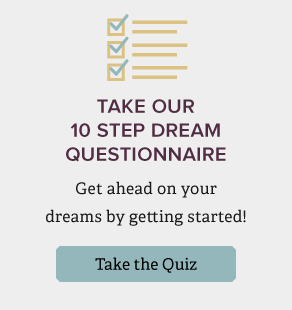 It’s a conglomeration of personal choices, desires, dreams, circumstances, etc. Each foreign adventure, each beach house payment, heck, each Adirondack chair makes a difference. Yours may be anything but average. But, the average cost of retirement can act as a reference point to help you plan accordingly. Here’s a comparison of spending habits between working-age consumers and older adults in seven major spending categories. Housing is the biggest expense for most Americans, and it remains so in retirement. Even if you finally pay off the mortgage before you retire, you’re still on the hook for utilities, property taxes, maintenance, etc. Still, older adults on average spend $3,000 less on housing than the rest of the working population. This can be attributed to downsizing and buying fewer household furnishings. 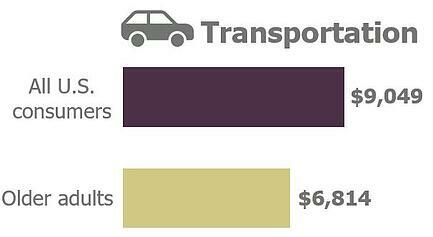 You can expect transportation costs to drop when you’re no longer making a daily commute to work. Whereas the average consumer dedicates more than $9,000 a year toward transportation, including vehicle purchases, gas and insurance, older adults spend an annual average of $6,814. Healthcare is a spending item that rises with age. Although Medicare does help older adults pay some medical costs for older adults, it doesn’t cover everything. Most notably, prescription drugs. Therefore, it’s important to consider Medicare supplemental coverage. Senior discounts can only save so much money. 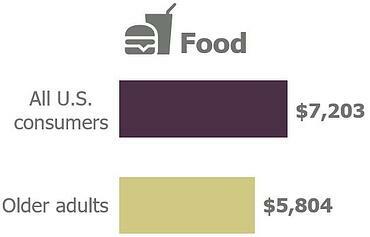 Food remains a top spending category for older adults. However, they spend substantially less, by about 20%, on average than younger age groups do on food. 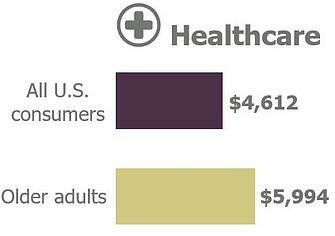 This is the category that shows the greatest difference in spending between older adults and average U.S. consumers. Those 65 and older spend nearly $6,000 less on personal insurance and “pensions,” which includes Social Security and pension plans. But, it makes sense. Older adults typically don’t have any dependents, so they generally have less need for life insurance. And, without a job, they no longer have to pay into Social Security or a pension plan. Perhaps with age comes generosity. Older adults spend on average $2,429 on cash contributions, which includes charitable contributions, compared with $2,081 given by the average consumer. Though retirees no longer have to work hard, they generally continue to play as hard as everyone else. 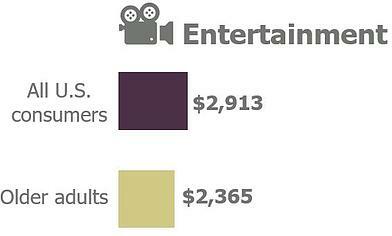 Older adults report on average spending just $548 less each year on entertainment costs than all other consumers. Now that you know what the average cost of retirement is like, you can start thinking about when you want to retire and how much you need to get there. A common guideline is you’ll need to replace 70-90% of your pre-retirement income to maintain the same standard of living you enjoyed during your career. But, many retirees experience an increase in other expenses or choose to enjoy the fruits of their labor and live more lavishly in retirement. Therefore, it may be more appropriate to consider a replacement ratio of 100%. At worst, this savings target gives you a little cushion for retirement (who can complain about saving too much?). Ultimately, how much you save today will determine how much you can spend in the future. You need a plan so that the true costs of retirement don’t take you by surprise. If you’re ready, start planning with us.